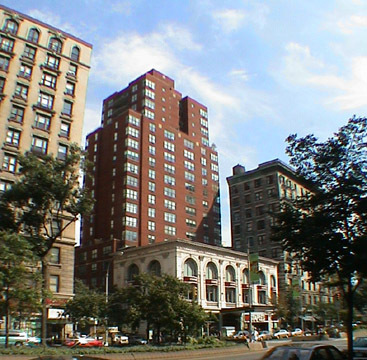 The small building was originally the RKO 81st Street Theater and was completed in 1914 to designs by Thomas W. Lamb, one of the nation's premier theater architects. The demolition of the vast majority of America's grandiose movie palaces is one the world's great cultural disasters. Although the interior was not saved here, the exterior was. The building is now used for retail purposes. Its conversion was designed by Beyer Blinder Belle, one of the city's premier architectural firms specializing in historic preservation. The 124-unit condominium apartment tower behind it was designed by William A. Hall and Charles B. Ferris Associates for developers Peter R. Gray and Louis V. Greco Jr. Although it is boxy and a bit bland, it is a good "background" building that does not overwhelm or interfere with the smaller building and therefore preserves its "light and air." Of course, most of Broadway has had a continuous and consistent cornice line and one could have argued that replacing the small building with a new mid-rise building flush to the building line would have been contextual. On the other hand, one of the nice virtues of Broadway is that is still has a fair number of low-rise buildings that provide more light and air. The solution here is appropriate and the tower's proportions are quite strong and the building, which has a health club and concierge, features corner windows and also has a low-rise base to the east, which includes some bay windows.